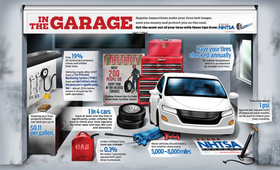 This informational graphic is part of NHTSA's recently launched TireWise campaign. WASHINGTON—The related issues of tire aging and tire safety are back in the mainstream news. ABC News has resumed coverage of the alleged dangers of tire aging, at the same time that the National Highway Traffic Safety Administration launched its TireWise consumer information campaign and website. Meanwhile, both the Tire Industry Association and Safety Research & Strategies Inc. expressed dissatisfaction with the TireWise website that went online May 13. In the story, reporter Brian Ross told of fatal accidents caused by the failure of 8- and 10-year-old tires. He reports finding an 81/2-year-old tire at a dealership in New York state, a 9-year-old tire at a Rhode Island dealership, and tires 11 and 15 years old at dealerships in the San Francisco area. Ross notes that the Big Three Detroit auto makers recommend removing tires at 6 years of age, and Michelin at 10 years. He also faulted the age information encoded in tire identification numbers as being difficult for consumers to interpret. SRS President Sean Kane, a longtime advocate of tire aging regulations, is quoted in the story, as is Dan Zielinski, senior vice president of public affairs for the Rubber Manufacturers Association. Zielinski said no data to support an “expiration date” for tires exists, and that allegations that the tire industry is trying to hide tire age information is false. The RMA, TIA and other tire industry groups have opposed tire aging legislation in Maryland and other states as both misinformed and unduly burdensome. Regarding the broadcast, Zielinski said other news programs—including “20/20,” “CBS Morning News” and “Today”—previously have run stories about tire aging. Meanwhile, NHTSA has conducted five phases of tire aging testing for light vehicle tires since 2002. Abigail Morgan, a NHTSA safety standards engineer, said in a speech last month at the Clemson University Tire Industry Conference that the agency will submit a report on its tire aging tests to its docket this spring. NHTSA will decide this spring whether to begin rulemaking on tire aging, Morgan said. The TireWise website can be found at www.safercar.gov/tires. NHTSA said the website and the TireWise program were designed to provide consumers and retailers with essential information about tire buying and maintenance. By disseminating this information, the agency said it hopes to reduce the approximately 11,000 tire-related crashes and nearly 200 tire-related fatalities in the U.S. annually. The website contains separate pages on tire buying, tire pressure, treadwear, tire aging, high temperatures and tire replacement. In its tire aging page, TireWise says owners of recreational vehicles, 15-passenger vans, collector cars and vehicles with low mileage are particularly at risk for tire failure due to age. The page advises monthly tire pressure checks, frequent maintenance inspections, rotation and alignment as the best ways to minimize the effects of tire age. It recommends checking TINs when purchasing tires for age information. Besides consumer information, the retailer section of TireWise site provides a “Life as a Tire” video to play for consumers shopping for tires, as well as a “Congratulations on a New Tire Purchase” form that retailers can fill out with customers. It also provides a Tire Buyer FAQ to give retailers quick answers for consumer questions about tires, including information on tire ratings and age. NHTSA will make all the TireWise content available to tire retailers and manufacturers across the U.S., the agency said. It will update its SaferCar mobile app for Apple and Droid products so users can sign up for tire recall alerts and submit tire-related complaints from their mobile devices, it said. TIA Executive Vice President Roy Littlefield said the association was encouraged by the launch of TireWise but also disappointed that most of the information on the website was not shared with the tire industry during the development stage. The association will reach out again to NHTSA with suggestions on how the TireWise program can be improved, according to Littlefield. SRS President Kane said the TireWise program fails to address tire aging and tire recalls adequately, which SRS considers the two biggest problems surrounding tire safety. The fault lies with TINs, which are hard for consumers and even tire technicians to decipher, he said. The TireWise introduction gave NHTSA an opportunity to do three things it should have done but didn't, according to Kane. These things were a non-coded manufacture date on tires, a TIN lookup website and a mechanism—in RFID or other commonly used technology—which a scanner could read to reveal a tire's manufacture date. NHTSA allowed the industry to comment on the initial drafts of TireWise, and the RMA took that opportunity, according to Zielinski.